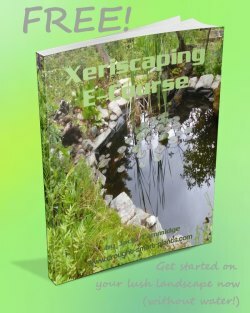 Xeriscaping - dry gardening and xeric gardens; fad, or new mindset? Whatever you call it, Xeriscaping is here to stay. With climate change bringing extreme weather conditions of drought, excessive rain and everything but the kitchen sink, the simpler the design and the lower maintenance of our gardens, the better. Adaptive landscapes mesh perfectly with the climate you live in, and surround your dwelling with a perfectly evolved eco-system. 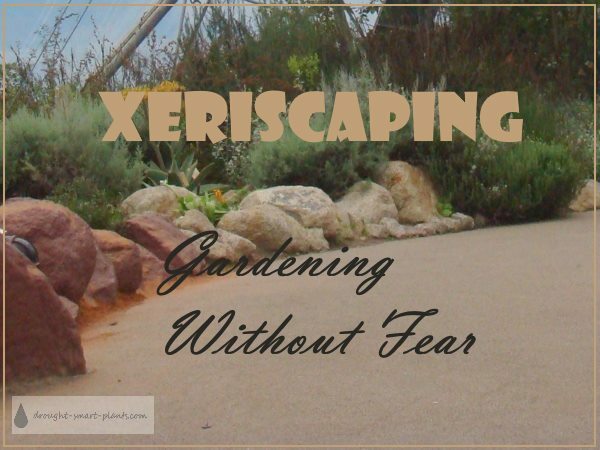 Xeric gardens can still be an enjoyable place to putter, grow our favorite plants and relax. In the initial stages of your landscaping plans, water conservation and soil conservation will be front and center. Choosing the plants - the part every gardener relishes - will might have to wait. Composting to provide organic matter to amend the existing soil, adding drip irrigation systems and rainwater salvage systems comes second. Using Permaculture techniques of plant placement and using gravity as a free way to move water around, and building rain gardens to capture that water off green roofs are important too. Finally; the plant choices. Staying away from water guzzling ferns, hostas and roses may not be your first instinct. Now, no pouting! There are still lots to choose from. 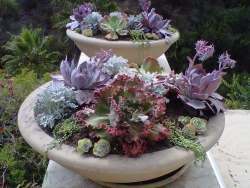 Choosing drought tolerant plants such as hardy succulents will give you almost maintenance free gardens. 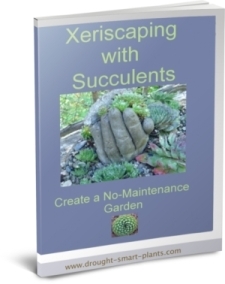 See my Ten Best Xeric Plants here for a great list to refer to when you're first starting out. Pocket gardens and container gardening will free up most of your garden for less needy plants grown in well mulched raised beds with customized xeric garden soil. Mulching with lava rock or some other type of pebble mulch will keep the soil moisture where it belongs – in the soil, a fire smart gardening technique. 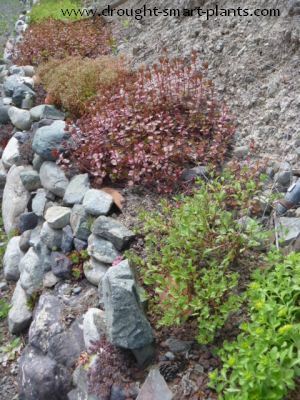 Trough gardens of alpine plants, Sempervivum and Jovibarba placed strategically on paved areas and soil cement pathways leading to intensely planted flower beds and herb gardens eases the burden of maintaining swards of lawn. A thyme lawn may take the place of intensively managed turf grass to give so much pleasure to bare feet. Watch out for the pollinators visiting the flowers - they love the small pink blooms, but you don't want to step on them. Speaking of insects, that's what a xeriscape does best - attract them. When you first walk into a garden planted with drought tolerant plants, it's astonishing to realize the sheer numbers of bees, butterflies and beneficials that these kinds of plants attract, both for their pollen and their nectar. A nectar corridor with plants for bees will attract many beneficial insects and hummingbirds to your garden. Xeriscaping is gardening for wildlife too, using native plants and wildflowers, and leaving some wildlife habitat undisturbed for reptiles and other xeric garden wildlife. Ponds, shelterbelts and hedgerows are crucial for migratory songbirds. Attract them to take on the pest control in your xeric garden. To protect all the wildlife you’ve attracted, you’ll probably garden organically and you’ll be amazed at how helpful the wild creatures are. Xeriscaping to attract xeric garden insects as your allies is a lesson in humility. Nature doesn’t require an arsenal of poisonous sprays to control pests, or the wasteful squandering of our most precious resource (water) – just a balance – and thoughtful xeriscaping. Let me answer your question about growing plants, their pests and diseases, or any other plant or garden related issue. Click on the picture of the icky bug. Xeriscaping, or building beautiful gardens with very little water, is a new buzz. Utilizing Drought Smart Plants that are beautiful, low water and hardy gives you a wide palette to choose from for your dry garden. Looking for more inspiration on using these great plants in your garden?